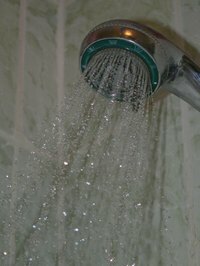 Cleaning the shower can be a daunting task, especially when hard water leaves cloudy calcium deposits on shower doors. These look like dried water spots but are slightly white in color and leave the doors looking dirty. Basic shower-cleaning products will remove mild residue from your shower, but calcium deposits can be removed with a few basic household ingredients. Spray the shower doors with full-strength white vinegar. The vinegar is a natural cleaning agent that will dissolve the deposits. Let sit for five minutes, then spray another coating of the vinegar onto the shower doors. Wipe the doors with a damp cloth, rubbing in small circular motions until all calcium deposits are removed. Rinse the doors with warm water, and dry with a towel to prevent new deposits from forming.